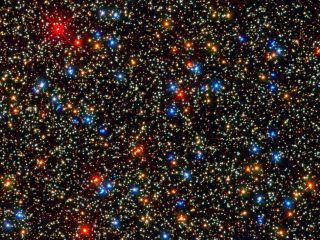 One of the first photos taken by Hubble Space Telescope's Wide Field Camera 3, installed in May 2009, shows the crowded core of the star cluster Omega Centauri. Dr. Jon A. Morse is the chief executive officer of the nonprofit BoldlyGo Institute, which is dedicated to advancing basic research and discovery from space through privately funded missions and public-private partnerships, and former director of the Astrophysics Division in the Science Mission Directorate at NASA Headquarters. Morse contributed this article to Space.com's Expert Voices: Op-Ed & Insights. Basic research in the space sciences holds essentially limitless potential for tackling profound questions of our existence and opening the doors of exploration, innovation and future economic opportunity. Space science continues to generate extraordinary discoveries, whether groups are exploring Mars, investigating the fundamental physics of the universe or discovering new exoplanets around nearby stars. It is encouraging to see that NASA is leaning more towards integrating commercial capabilities into how space science missions are implemented, especially for cubesats and small satellites. It is imperative that NASA embrace the many commercial capabilities that are becoming available in the small-sat market, which may reach $20 billion/year globally in the next few years. Such capabilities — including optical systems, sensors, spacecraft busses, launch vehicles and other mission elements — can be procured much more cheaply now than in recent years. These cheaper capabilities may not be represented in any costing models used during NASA scientific mission proposal reviews, and NASA must actively stay on top of such developments, perhaps even facilitating their use by candidate mission teams through workshops with relevant industry representatives. However, there are additional actions that NASA or other space agencies could take to accomplish high-priority science goals and increase the flight rate within a constrained fiscal environment. First, NASA needs to say in a steady stream of messaging that the agency desires private investment in space science missions. This message has been trumpeted for human spaceflight and space technology development, but for space science is generally an afterthought, sometimes mentioned as part of Q&A responses during advisory committee meetings, or is missing altogether in agency presentations. The NASA budget blueprint released in March 2017 boldly states in the very first sentence that the proposed budget "supports and expands public-private partnerships as the foundation of future U.S. civilian space efforts." That would seem to include space science, but it is difficult to see how the space science portfolio is making such a transition. While it is common for institutions proposing a project to NASA to offer some salary support for mission team members and even make contributions to the payload, significant cost-sharing on space science missions addressing National Academy of Sciences priorities has yet to be demonstrated; instead, cost sharing tends to be accomplished through international partnerships. The main difficulty in executing private space science missions or increasing public-private partnerships is in securing private funding. There is noticeable progress in the number of self-funded university-based cubesat programs, and cubesats can accomplish interesting new science. But many high-priority science goals would need at least tens of millions of dollars of investment to build the appropriate spacecraft. There are several ways to approach fundraising, including through philanthropy, sponsorship and venture capital (in addition to cost sharing among different, perhaps international, organizations). Major philanthropic funding is commonplace in other scientific disciplines, i.e., medical research and ground-based astronomy, with modern project costs now on a par with those of sophisticated satellites, such as are developed in NASA's Explorer, Discovery and New Frontiers programs. The nonprofit BoldlyGo Institute, founded in 2013, seeks to expand the philanthropic model to frontier space-based science missions — but the list of individuals or family foundations willing to support space science missions at seven- or eight-figure amounts may be limited. We, therefore, also propose additional mechanisms that NASA could employ to incentivize private investment, reduce mission costs and accelerate the pace of discovery. Besides considering funded Space Act Agreements, which are used in the human spaceflight program, as a procurement mechanism for small- and medium-class space science missions, NASA should also examine employing data buys and science prizes to lower costs and promote private investment and public-private partnerships. Our experience seeking private funding for space science indicates that significant venture capital could be available if there were even a modest return on investment. We do not usually consider scientific data as a commercial commodity, but if NASA were to offer a payout or science prize, analogous to the Google Lunar X Prize, or indicate that the agency would pay for certain data, such capital could be raised — as long as the payout or prize were roughly commensurate with the capital costs of the mission. NASA could pool resources with major research foundations and consult with the space science community to identify potential scientific goals that could be attained in this manner. Of course, this would be worthwhile only if significant cost savings could be realized compared to NASA's traditional procurement and mission-development processes, making it possible to accomplish more missions (and more science) within a given budget. The dynamic, successful commercial satellite and launch industries, with entrepreneurial visionaries and nongovernmental sources of capital, now provide such cost-saving opportunities for many scientific applications. Now is the time to unleash this entrepreneurial spirit in the cause of basic scientific research and discovery. Morse is Mission Executive of Project Blue, which is raising funds on IndieGogo for a private space telescope to seek planets around the stars of Alpha Centauri. Morse is also a former senior policy analyst in the Division of Physical Sciences & Engineering at the Office of Science & Technology Policy in the Executive Office of the President; former professor of physics, applied physics and astronomy and associate vice president for research for physical sciences and engineering at the Rensselaer Polytechnic Institute in New York; and current research associate in the Solar, Stellar and Planetary Sciences Division at the Harvard-Smithsonian Center for Astrophysics.